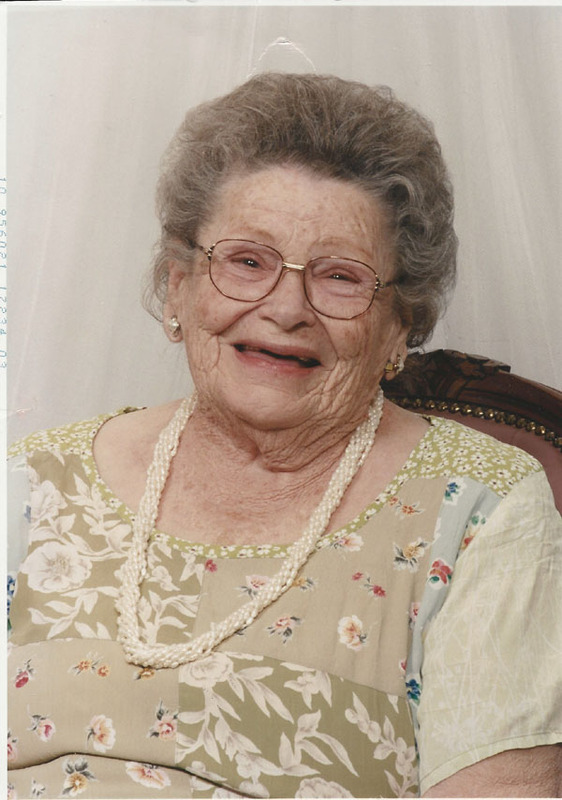 Maggie Brooks Stucki, at the age of 103 years, peacefully returned to her heavenly home on Wednesday, May 20, 2015. Born to George Brooks, Jr., and Flora Morris on August 2, 1911, the second of nine children, she graduated from Dixie College and then from BYU in 1933, as a certified teacher and taught grades 1-3 in Santa Clara, Utah. After meeting on a blind date, she and Merrill Stucki were later married on March 17, 1934, and they both taught school in Springdale, Gunlock, and Veyo, Utah, before settling in St. George for their remaining years. Maggie was well known for her artistry in flowers as owner of Brooks Floral for many years. She and Merrill served as ordinance workers in the St. George Temple for many years, taking time out to serve a mission in Indiana before returning to additional years of temple service. Her adult life included serving in various positions for the Church of Jesus Christ of Latter-day Saints. Her other interests include politics, Dixie Reviewers and Rotary-ann, along with complete devotion to her family. She remained in her own home until 100 years of age followed by her residency at Kolob Care Center where she resided until her death. She was preceded in death by her parents, her husband, one son, George Christian; and siblings, Anna Taylor, Lee Brooks, Morris Brooks, Waldo Brooks, Helen Anderson and Olive Esplin. She is survived by her siblings, Emily Pope and Flora McMullin Reid. Her surviving children are David M. Stucki, Mary Lynn Tousa (Jerry, and Jeannette Stucki, along with 21 grandchildren, 62 great-grandchildren and 10 great-great grandchildren. Our heartfelt gratitude and appreciation are extended to those who so lovingly served her at Kolob Care Center, Southern Utah Hospice and Horizon Hospice. Funeral services will be held Saturday, May 30, at 1:00 p.m. at the St. George East Stake Center, 449 S. 300 East, St. George. There will be a viewing held Friday, May 29, from 6-8 p.m. at Spilsbury Mortuary, 110 S. Bluff Street, and Saturday, from 11 a.m. to 12:30 p.m. prior to services at the Stake Center. Arrangements have been made under the direction of Spilsbury Mortuary, 435-673-2454. Friends and family are invited to sign Maggie’s guestbook at the Spilsbury Mortuary website. Maggie was a beautiful, kind and highly intelligent lady with a wonderful sense of humor. She will be missed. My condolences to her family and friends.